A TWO-year-old girl is caught up in a custody battle between her sperm-donor gay father and her lesbian mothers in what is becoming the modern reality in family court proceedings. 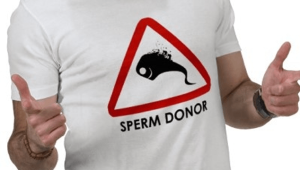 The sperm donor dad has been granted access to his daughter despite the objections of her lesbian parents to his youthful partying ways. The man had been seeking shared custody of his two-year-old biological daughter that would have seen her living with him five nights a fortnight. But her lesbian mums – who gave their daughter the man’s surname and named him on the child’s birth certificate after he provided genetic material for artificial insemination – argued he was not mature enough to care for the girl. During a two-day Federal Circuit Court hearing, they produced text messages, Facebook postings and tweets to prove the man, a long-time friend, regularly abused drugs and alcohol. “A scotch a day helps me work rest and play,” read one. “Coke is always good after a big night of drinking. I agree. Both the powder and the liquid,” another said. The women said while they wanted the girl to have a relationship with the man, they argued it should be limited to relatively brief daytime encounters. Judge Judith Small said differences in the parties’ understanding of the terms of agreement they thought they had made in relation to the girl’s care began to arise during the pregnancy. Three months after she was born, they had sought legal advice about the father’s role. The women said they regularly welcomed the man into their home to spend time with the girl but didn’t believe she was ready to be left alone with him overnight. They argued he was unable to change a nappy and ignored her special dietary requirements that had left her unwell. The lesbian couple are the girl’s legal parents because they were in a defacto relationship when she was born and therefore the “father” is not considered a parent under the law, Judge Judith Small said in the Federal Circuit Court of Australia. But he still has the right to play a significant role in her life and the mothers must put his name on all the girl’s medical and school forms and make sure he can go to all school events and functions usually attended by a child’s family, the judge ruled. She said the women had been shocked and surprised when the father began custody proceedings after the girl was three-months old because they thought everything had been agreed. “Both (the women) appeared genuinely distressed by the proceedings and expressed irritation that they found themselves in court having to defend their family structure,” Judge Small said. The father was in a gay relationship when the two men began to talk to the women about having a child, the court heard. “Does anyone want to be a surrogate for me or have a baby with me?” the father sent to the woman who ultimately became the mother. The relationship between the two men broke down but the surrogacy went ahead through artificial insemination and the mother became pregnant at the first attempt. The father was present at the birth. While the girl lives with the women, the father has cut back on his work and moved in with his own mother so he can be closer to his daughter and has seen her every week since her birth. He also pays child support, which he does not need do. But he said the lesbian couple had been “overly critical” of his parenting skills and found fault with him at every opportunity including that he didn’t clean the girl up properly when he changed her nappy. “I have no doubt that he adores (her) but she is not a commodity to be traded between him and the (women),” Judge Small said. Judge Small drew up a timetable for the parents to share their daughter, who will spend nights with her father, at least until she begins school. In previous cases, the Family Court has ruled that a sperm donor, while not named on the birth certificate, could be legally considered a parent and decided another case where a lesbian couple had split up but both wanted to be called “mother”.